Word Rings / 2 Rings Level 24Answers, Cheats, Solutions for Android, iPhone, iPad, iPod. Note: This is "Word Rings / 2 Rings" by "Second Gear Games"
Word Rings / 2 Rings Level 23 Answers, Cheats, Solutions for Android, iPhone, iPad, iPod. Word Rings / 2 Rings Level 22Answers, Cheats, Solutions for Android, iPhone, iPad, iPod. Word Rings / 2 Rings Level 21Answers, Cheats, Solutions for Android, iPhone, iPad, iPod. Word Rings / 2 Rings Level 20Answers, Cheats, Solutions for Android, iPhone, iPad, iPod. Word Rings / 2 Rings Level 19Answers, Cheats, Solutions for Android, iPhone, iPad, iPod. Word Rings / 2 Rings Level 18Answers, Cheats, Solutions for Android, iPhone, iPad, iPod. Word Rings / 2 Rings Level 17Answers, Cheats, Solutions for Android, iPhone, iPad, iPod. Word Rings / 2 Rings Level 16Answers, Cheats, Solutions for Android, iPhone, iPad, iPod. Word Rings / 2 Rings Level 15 Answers, Cheats, Solutions for Android, iPhone, iPad, iPod. Word Rings / 2 Rings Level 14 Answers, Cheats, Solutions for Android, iPhone, iPad, iPod. Word Rings / 2 Rings Level 13Answers, Cheats, Solutions for Android, iPhone, iPad, iPod. Word Rings / 2 Rings Level 12 Answers, Cheats, Solutions for Android, iPhone, iPad, iPod. Word Rings / 2 Rings Level 11Answers, Cheats, Solutions for Android, iPhone, iPad, iPod. Word Rings / 2 Rings Level 10 Answers, Cheats, Solutions for Android, iPhone, iPad, iPod. Word Rings / 2 Rings Level 9Answers, Cheats, Solutions for Android, iPhone, iPad, iPod. Word Rings / 2 Rings Level 8Answers, Cheats, Solutions for Android, iPhone, iPad, iPod. Word Rings / 2 Rings Level 7Answers, Cheats, Solutions for Android, iPhone, iPad, iPod. Word Rings / 2 Rings Level 6Answers, Cheats, Solutions for Android, iPhone, iPad, iPod. Word Rings / 2 Rings Level 5Answers, Cheats, Solutions for Android, iPhone, iPad, iPod. Word Rings / 2 Rings Level 4 Answers, Cheats, Solutions for Android, iPhone, iPad, iPod. Word Rings / 2 Rings Level 3 Answers, Cheats, Solutions for Android, iPhone, iPad, iPod. Word Rings / 2 Rings Level 2 Answers, Cheats, Solutions for Android, iPhone, iPad, iPod. Word Rings / 2 Rings Level 1 Answers, Cheats, Solutions for Android, iPhone, iPad, iPod. Word Rings / 2 Rings Answers for all levels. 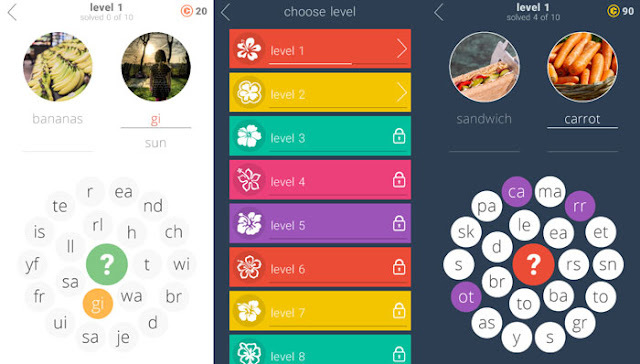 Word Rings / 2 Rings is an word finding puzzle game made by Second Gear Games and available to play on any android device. The aim of this logic game is to form word by selecting the groups of letters inside the ring. You have 2 pictures at any time, to give you hints on what words you need to find. Most of the levels are easy to solve, but you will find a few that will be a little harder, and you may need help to find the correct answers to them. If you can't find an word you can't play the rest of the game, and you will need to cheat your way if you want to enjoy the rest of the game. Below you can find links to the answers for all the levels, just pick the one you seek. Logo Quiz Ultimate by symblCrowd Level 10 Answers, Cheats, Solution for Android, iPhone, iPad, iPod. Note: This is "Logo Quiz Ultimate" by "symblCrowd"
Logo Quiz Ultimate by symblCrowd Level 9 Answers, Cheats, Solution for Android, iPhone, iPad, iPod. Logo Quiz Ultimate by symblCrowd Level 8 Answers, Cheats, Solution for Android, iPhone, iPad, iPod. Logo Quiz Ultimate by symblCrowd Level 7 Answers, Cheats, Solution for Android, iPhone, iPad, iPod. Logo Quiz Ultimate by symblCrowd Level 6 Answers, Cheats, Solution for Android, iPhone, iPad, iPod. Logo Quiz Ultimate by symblCrowd Level 5 Answers, Cheats, Solution for Android, iPhone, iPad, iPod. Logo Quiz Ultimate by symblCrowd Level 4 Answers, Cheats, Solution for Android, iPhone, iPad, iPod. Logo Quiz Ultimate by symblCrowd Level 3 Answers, Cheats, Solution for Android, iPhone, iPad, iPod. Logo Quiz Ultimate (Hard) by symblCrowd Level 2 Answers, Cheats, Solution for Android, iPhone, iPad, iPod. Logo Quiz Ultimate (Hard) by symblCrowd Level 1 Answers, Cheats, Solution for Android, iPhone, iPad, iPod. Logo Game: Guess the Brand [Regular] Level 53 Answer, Cheats, Solution for Facebook, Android, iPhone, iPad, iPod.